Aspiring sheep shearers flocked to the UC Hopland Research and Extension Center in May for a week of training on the proper techniques for harvesting wool from sheep, reported Tiffany Camhi on KQED Radio News. “We try to get the students shearing the first day because they make a lot of mistakes,” said UC Cooperative Extension advisor John Harper, who heads up the annual training session. 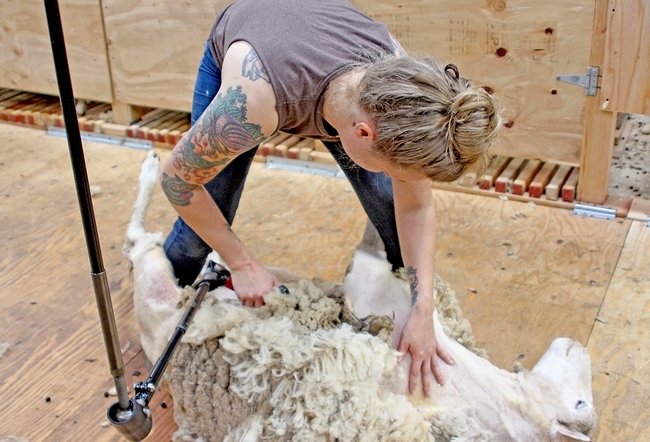 The school teaches the New Zealand style of shearing, which causes the least amount of stress for the sheep and the shearer. It involves some fancy footwork, which Harper likens to a dance. Expert sheep shearers can expect to find work that pays well. UCCE advisor Dan Macon said the growing popularity of backyard flocks in California is adding to the demand for shearers.